For our latest Meet The Mom we got chatting with Tasmin Johnson. 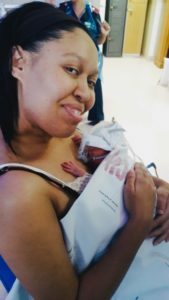 Tasmin’s son was born prematurely at just 7 months, and she opened up to us about the importance of support systems, how donor milk saved her baby boy’s life and what she’s learned so far on her journey as a Preemie Mom. Please tell us, in your own words, the story of how one of your children was born premature. My baby boy was born at 28 weeks due to placenta abruption. I started bleeding one day while visiting friends and was rushed to the hospital. By the time I went for a scan the bleeding had actually subsided quite a bit, but they still booked me in so they could monitor us. Everything was going well the next day but the following morning, at about 4:30am, I was woken by a gush of blood. The doctors came in and told me they would have to deliver my baby immediately. I have never been so scared in my life. I had just enough time to phone my husband and tell him that they were taking the baby out. I was put under, so I was not awake when my baby was born. I didn’t even know what baby I was having. When I finally came to, the nurse told me that I had a baby boy born at 5:28am weighing 1,080kg. She said he cried when he was born, and he was doing well. I would only get to see my child nine hours later. I would also like to explain that 6 weeks prior to my baby being born I was in a car accident, and I believe that had a lot to do with my placenta ruptured. When you look back, what was the biggest challenge for you during this experience? I’m not going to lie, everything about having a pre-term baby is hard. But the greatest challenge was producing enough breast milk. My baby’s stomach was too immature to handle formula so he could only take breast milk, and the milk didn’t just “come in” on its own. I sat patiently waiting for this gush of milk to start flowing after I gave birth and it just didn’t happen. Eventually the doctors said, “Your baby is starving, we need to give him donor milk.” I didn’t even know there was such a thing as donor milk, but I was so happy that there was, as it quite literally saved my baby’s life (thank you mommy, whoever you are, wherever you are. You gave my baby the gift of life). I then went into overdrive. I began pumping like there was no tomorrow. The first couple of days were quite easy because he wasn’t taking too much milk. But as the feedings increased, so did the demand to pump more. This was when I realised that I didn’t have enough milk to feed my baby. With the help of a dietician I was armed with enough information and meds to help me. I also pumped every 3 hours. I never really experienced much of an increase until I held my baby for the first time. I kangaroo carried him and believe it or not the milk just came gushing out. This was when I realized the importance of the baby when it comes to producing breast milk. What can help a Preemie mom feel encouraged and supported after giving birth? Is there any advice you would give other Preemie Moms? That saying “it takes a village to raise a child” is even more true when you have a preemie. 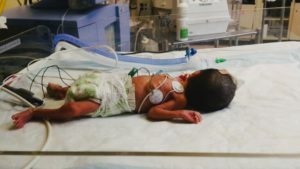 Prematurity does not end when you leave the hospital. In fact, I think you’re more affected by your child’s prematurity when you’re home, rather than in the hospital, because you’re no longer surrounded by the medical professionals. I have also noticed that Preemie Moms don’t always attend their neonatal follow up visits after going the first two or three times. I would advise any Preemie Mom to continue going to these important appointments, as it’s a great way to understand your child’s development. This is where you get to ask all those daunting questions or address any concerns you may have. It’s also where the doctors are able to pick up on any problems. Did this experience shape your relationship with your son? If so, how? Absolutely. But I think the bond created between him and his dad is even greater. Maybe it’s because his dad got to spend the first 8 hours of his life alone with him. What are you most grateful to have learned? I’m most grateful to have learned that pre-term babies can survive and lead full, happy lives. It just takes a lot of patience, commitment and hard work from all involved, especially the parents. What word (or words) would you use to describe your journey of motherhood so far? My second journey into motherhood has been quite the rollercoaster ride, but prematurity has changed my life for the better. Before I was so focused on work and making money, never taking the time to enjoy the child that I had then, or just life in general. Prematurity gave me pause. It allowed me to grow in my faith and take time to be in the moment, appreciating the little things. In the past year I have been able to be there fully for both my children and I believe they are both thriving because their mom is always with them. The things I took for granted when my older son was born I now appreciate wholeheartedly. We still have quite a way to go on our prematurity journey, but the birth of my son has allowed me to have a bigger purpose in life.